Coverage: Watch live on BBC Two Wales, BBC Red Button, online, tablets, mobiles and BBC Sport app. 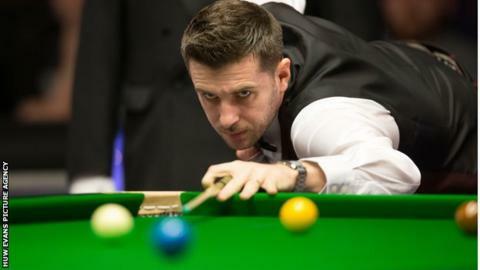 Mark Selby has ended Welsh outsider Duane Jones' Welsh Open hopes as the world number one cruised to a 4-0 win. Jones, the lowest ranked Welshman in the tournament, was outclassed as Selby dropped just 76 points - 41 points of them in a "big" second frame. Jones was "kicking himself" as the the world number 118 missed a blue in the second and Selby took control as Jones' Welsh debut lasted under 90 minutes. Later in the day Wales' Matthew Stevens beat Ireland's David Morris 4-2. Stevens will face Martin O'Donnell in round two after the Englishman beat Scotland's Stephen Maguire 4-3. Fellow Welshman Lee Walker lost 4-2 to world number eight Barry Hawkins. Dominic Dale lost 4-3 against England's Alfie Burden in a match that finished at 00:30 GMT.